As tiny vessels for affirmations, sticky notes can make a big impact. Never underestimate this small but meaningful gesture. This week I’m grateful for Post-it® notes. Or more accurately, notes written on Post-its®. Allow me to explain. Today was a good morning (especially compared to last night) which is saying a lot considering how things have been at our house lately. I hate it when people I care about are hurting. I want to Green Mile away their pain, absorb it until they’re free from worry and sadness. This is especially true when that someone in question is a child: our youngest daughter. But unexpected, temporary relief came this week in the form of a note written on a Post-it®. More accurately, many notes on many Post-its®, written by another child: our eldest daughter. The simple act of writing affirmations, encouraging words, and reminders of loving support on those sticky notes were enough to break through the overwhelming fog of despair and produce a rarity these days: a genuine smile of happiness. It’s amazing how easy it is to brighten someone’s day with a quick jot of pen to paper. Your kind words — and the sincere gesture of making sure they’re known — can make all the difference. Slip a loving message into your partner’s suitcase before a business trip. Surprise your child by including a napkin note in her lunch bag. Send a handwritten thank you to a client or colleague who helped you. Comment on a post that resonated with you. 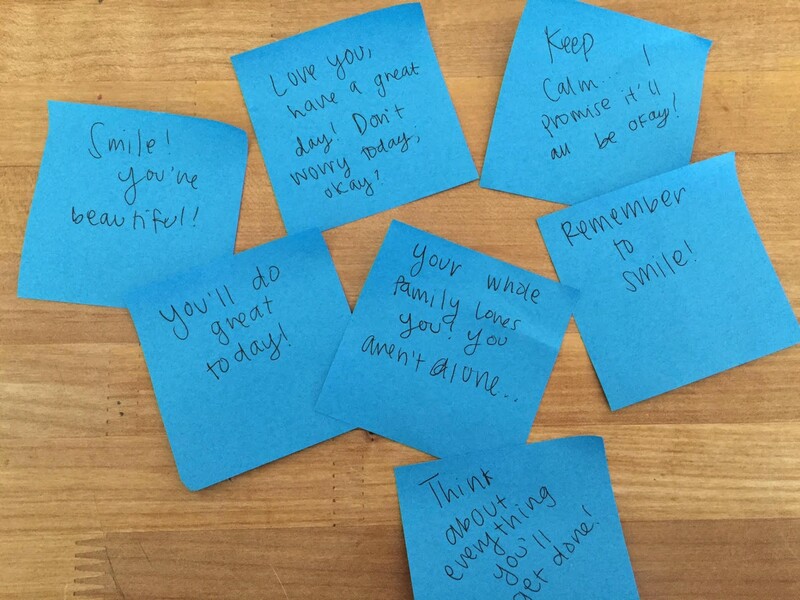 Leave a sticky note on the mirror to remind someone they’re not alone. Or do all of these things. Just because. I guarantee they won’t go unnoticed. An earlier version of this post appeared on LinkedIn. Amy is the president of rbp consulting, a consultancy specializing in helping transform organizations in transition. When she’s not involved in some sort of makeover, you’ll find her…unhappy. She enjoys being a badass writer, playing co-ed volleyball, and pretending she has her own HGTV show. She loves traveling and spending time with her friends and family, which includes a yellow lab named Rigby. She’s always loved office supplies, but lately, Post-it® notes are her favorite. Contact Amy at rbpconsulting.org or on Twitter @amyblaschka.